Claudio Paoloni received the Degree in Electronic Engineering from the University of Rome "Sapienza", Rome, Italy, in 1984. In the period 1986 - 2012 he was researcher in the Electronic Engineering Department of the University of Roma Tor Vergata, Rome, Italy. He won the STMicroelectronics GE 2005 award. Since 2008 he is involved in the coordinating group of European Project OPTHER (Optically Driven THz Amplifier). He is author of more than 125 articles in international journals and conference proceedings. He holds on patent. He served as Local Organisation Chair of IEEE International Vacuum Electronic Conference 2009 (IVEC 2009). He served as member the Local Organising Committee of International Conference on Infrared, Millimetre, and Terahertz Waves 2010 (IRMMW- THZ-2010) in Rome. He will be Conference Chair of UK/Europe China Millimetre Wave and THz Technology Workshop 2013 to be held in Rome. 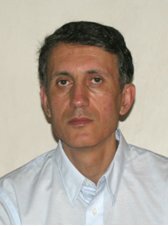 He is external reviewer for Rumanian National Research Council. He is member of the IEEE Electron Devices Society Vacuum Devices Technical Committee. He is reviewer for about fourteen main scientific journals in the field. He is in the editorial board of IEEE Trans. on THz Science and Technology. He was nominator for Prof. Richard Carter, recipients of the 2009 IVEC Award for Excellence in Vacuum Electronics. He realised and maintains the web-portal of the IEEE Electron Devices Society Vacuum Electronics Committee to promote vacuum electronics in the scientific community. He conducted research in different fields such as microstrip microwave circuits, beam-forming networks for active phased arrays, travelling wave amplifiers, ultra-wideband matrix microwave amplifiers, and MMIC yield evaluation. His current interest includes analysis of slow wave structures for travelling wave tubes, design and simulation of vacuum electron devices, amplifiers and backward wave oscillators, for millimetre wavelengths and THz frequency band.